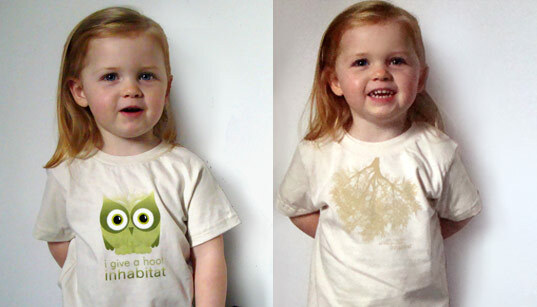 Check out our line of soft and cuddly, eco-friendly Inhabitots T-shirts. Cute, right? If you’ve been coveting one of our organic kids tees or eco baby onesies, now is a great chance to pick one up FOR FREE for the little eco-cutey in your life – as we are giving away a bunch on the site this week. To share our love for green and say thanks to our loyal readers, we will be giving away FIVE Inhabitat green kids tees this week to five randomly selected people who sign up for our daily newsletter, AND FIVE shirts of our choice to the first five people who sign up with our newsletter. Want one? Be one of the first to sign up for Inhabitots and win one right now! Both of our eco-friendly kids t-shirts are made from 100% organic cotton and are hand-printed with eco-friendly, water-based inks. The tagline of our Owl tee (with some fond nostalgia for the 70’s US Forest Service Campaign), reads ‘I give a hoot’. We have both baby and kids sizes in all designs, as well as onesies in both designs for babies: baby sizes run 3-24 months, kids sizes run 2T – 6T. 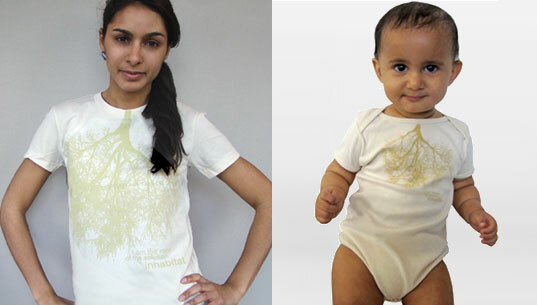 Check out our line of soft and cuddly, eco-friendly Inhabitots T-shirts. Cute, right? If you've been coveting one of our organic kids tees or eco baby onesies, now is a great chance to pick one up FOR FREE for the little eco-cutey in your life - as we are giving away a bunch on the site this week. To share our love for green and say thanks to our loyal readers, we will be giving away FIVE Inhabitat green kids tees this week to five randomly selected people who sign up for our daily newsletter, AND FIVE shirts of our choice to the first five people who sign up with our newsletter. Want one? Be one of the first to sign up for Inhabitots and win one right now!